Happy Friday!! I'm back with some more Power Poppy inspiration for you all, and I had some fun with this new digital image called Sunset Sway. I thought it would be a great idea to color the background like a sunrise since a sunrise and sunset were included in the sentiment. While I was picking colors for the flowers, I thought, why not include the colors of the rainbow. 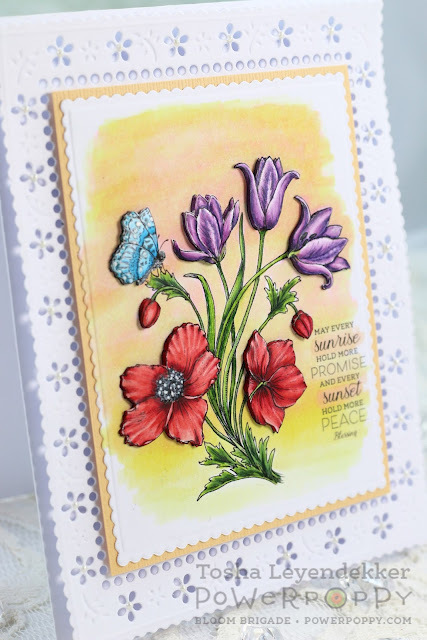 So, I have red Anemones, orange and yellow in the background, green leaves, a blue butterfly and purple Tulips. I don't normally work with so many brights, but I truly enjoyed making this (for me) bold card. Since my colors were so bold, I decided to keep the background simple with a peach mat, and a white diecut frame called English Picnic by Tonic. I used Photoshop to add the sentiment directly with the image, printed it out twice and cut out each bloom and the butterfly. I then burnished them and popped them up onto the image for some extra dimension. Lastly, I added some Ivory Seashell Crystal Drops (Nuvo) to the diecut centers of the little flowers in the frame. Here's a close-up angle so you can see the dimension a bit better. Thank you all for dropping by! I hope you have a delightful weekend!! Hello, hello, hello my friends!! 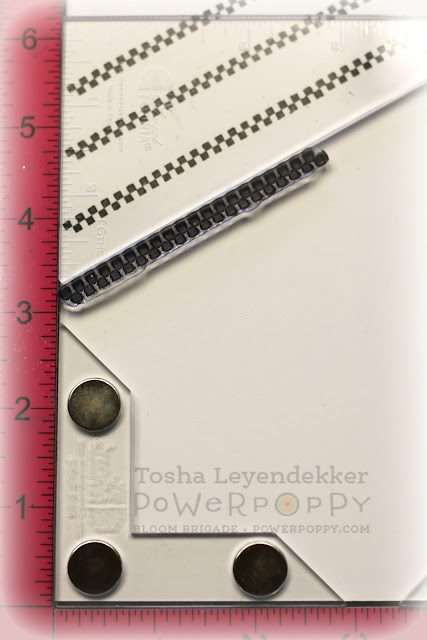 I'm back with another Power Poppy project and boy was this a fun one. I love succulents and have quite a few outside my front door. I love the colors, textures and depth of all the petals, and the fact that some of them even get some sweet little colorful blooms. 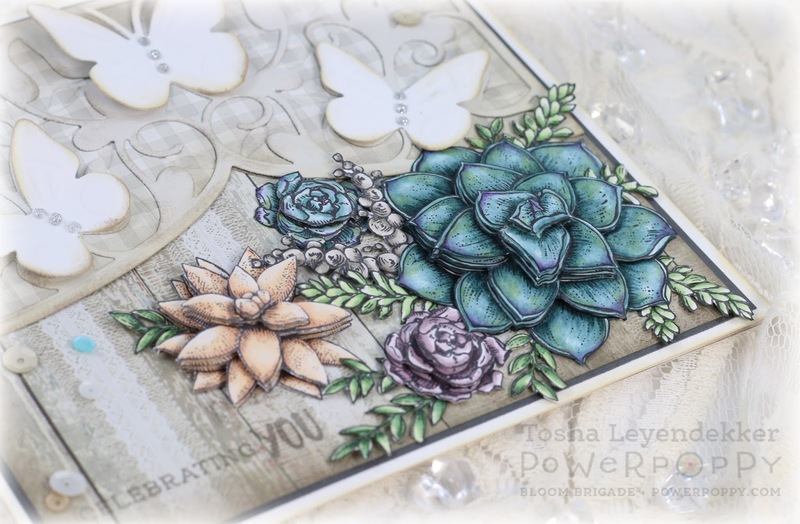 When I first saw Power Poppy's Succulent Singles, I knew I wanted to create a little succulent collage, so when I received this fun new Fluttered Fence Idyllics Embossing Folder and and Die set by Tonic, I thought they would be a perfect combination. I started by stamping each main succulent 5 or 6 times. I then numbered the petals according to which layer I wanted them so I didn't have to color each image every time. The largest succulent has 6 layers, the pale one 5 layers, and the other two 4 layers. Each layer was cut out, burnished (my tutorial can be found HERE) and added with dimensional tape. I have a close-up below so you can see the individual layers. The top panel was made with three layers also. 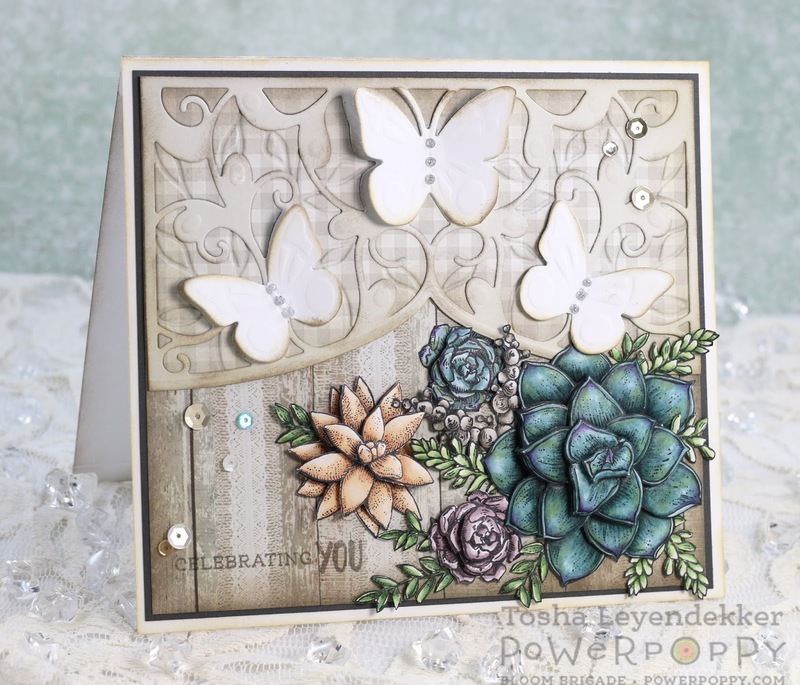 I layered the butterfly diecut over a piece of gingham decorative paper (Love Garden by Fabscraps) after embossing it with the included embossing folder. I then diecut an extra white piece and hand-cut the butterflies, folded their wings and adhered them in their centers to give them depth. I also added some Silver Moondust Glitter Drops (Nuvo) to the butterfly centers, as well as a few scattered sequins. 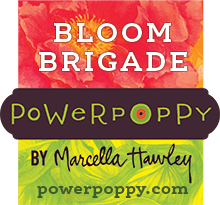 It's Power Poppy's 3rd Birthday and Marcella really knows how to celebrate. Thank you so much for dropping by. I hope you have a nice restful weekend! Happy Friday y'all!! Today is an exciting day for sure!! The Power Poppy Bloom Brigade is teaming up with the Sweet Petunia Team to do a blog hop featuring the Misti and the new Misti Creative Corners!! I tell ya, the Misti is a definite "go-to" tool for me. I use it OFTEN!! Seriously! And I'm super excited to show you how I used it and its new Creative Corners. They are easy, fun and super handy!! 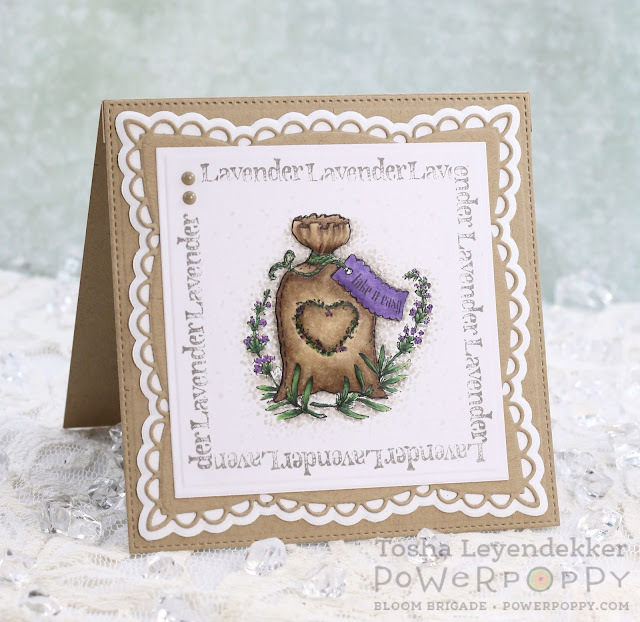 I have two projects to share with you today, and I'm going to start with my Lavender card, using Power Poppy's Lavender clear stamp set, and Misti's Creative Corners. I knew I wanted to make a "sentiment square", so I took the two right angle magnetized corners and put them together to form a square. Now the magnets do not want to be close together when they are the same side, so I flipped one angle upside down, and they pieced together beautifully so I could stamp the sentiment around the square. 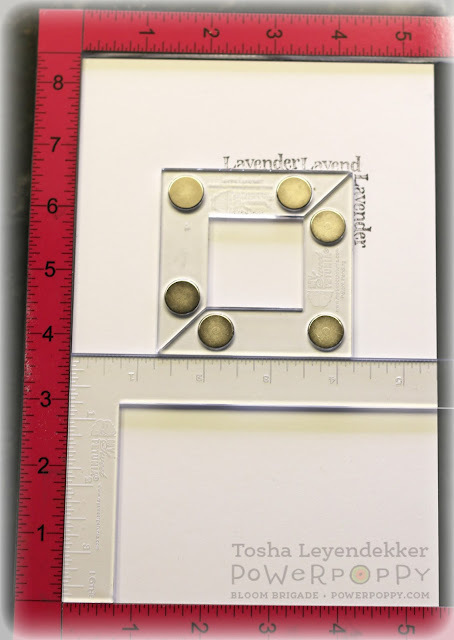 I put the L-ruler along the bottom to keep the magnet square in place, and removed it when I wanted to stamp along the bottom. 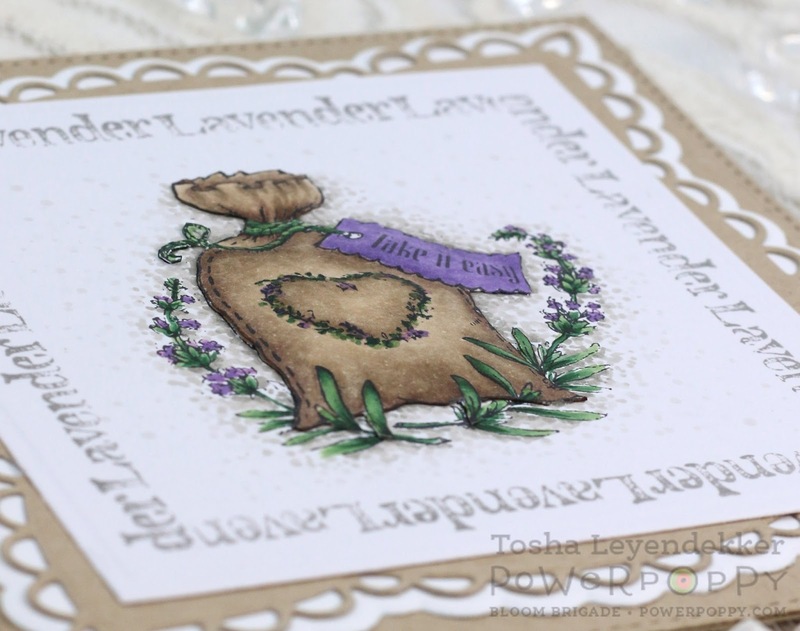 I also used the Misti to place the lavender bag image directly in the middle of my sentiment square. I stamped the bag a second time on a scrap piece of paper to color, burnish, and pop up with a dimensional square right in the middle to give the bag some depth. The edges are all glued down flush with the base. 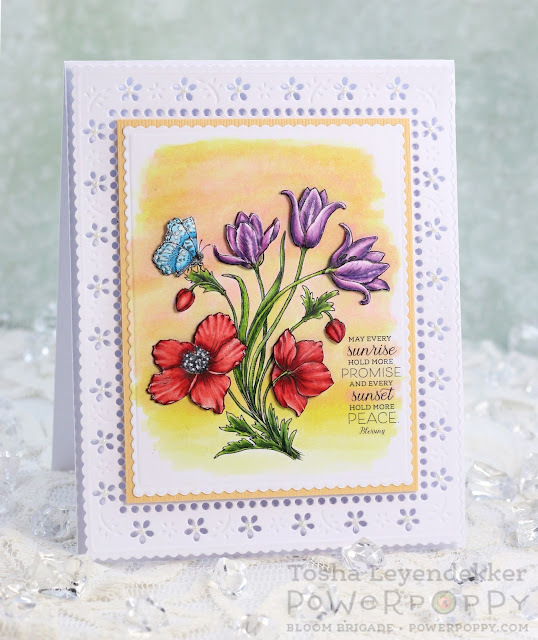 Next, I have a masculine card to share with you, using the Power Poppy clear stamp set Move the Soul. I have to tell you, I had an awesome time creating the background for this one. With the Misti, and its Creative Corners right angle triangle, it is so easy to create a sentiment pattern on an angle. I love how lined up the background is. 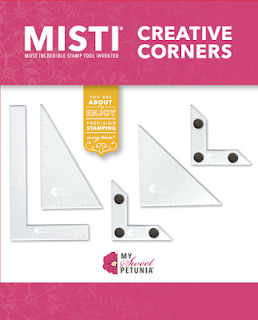 The Misti has measurements along the side and bottom, so it's easy to position the triangle and stamp every time. 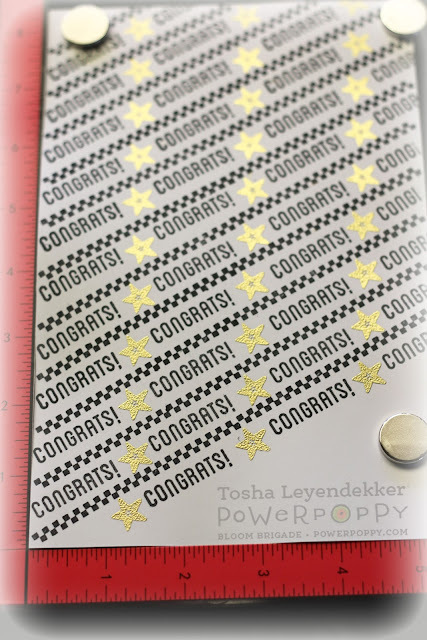 I just slid the triangle down in 3/4" increments each time to stamp the checkered strip. Easy-Peasy! The next step was equally as easy to add the "congrats" sentiment with the same triangle. Lastly, I gold embossed the stars from the same Move the Soul set. 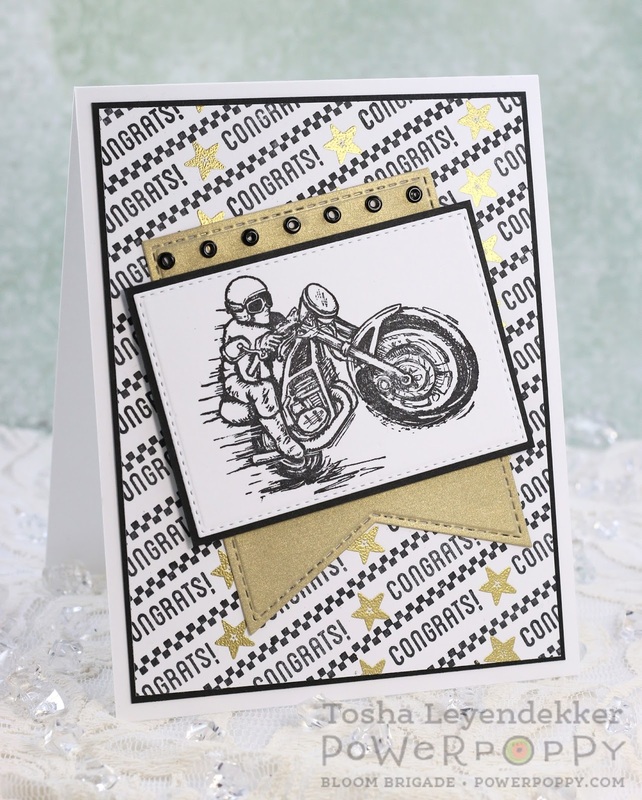 I used Versamark ink and Gold Embossing Powder (Ranger) and unlike the rest of the background, I free-handed the stars because I thought it would take too long to stamp the stars and emboss them using the Misti...too many steps for me. 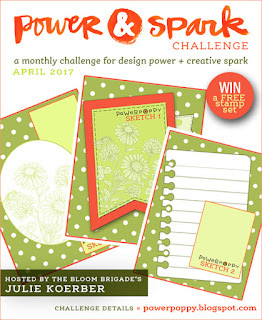 Now since it is the first Friday of the month, Power Poppy is issuing another Power and Spark challenge, which this time is provided by our dear, dear Julie!! She has graciously provided 3 different sketches to try. I used the middle sketch, with the banner, for my masculine card today. I hope you will take the time to try out one of these 3 sketches. I think they're super fun!! 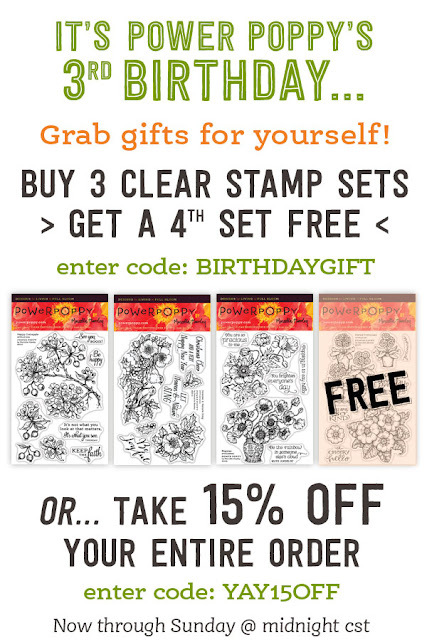 Besides, each time you participate, you have an opportunity to win some free Power Poppy stamp sets! Now, that is inspiration if you ask me!! That's it for my projects today. I've provided a link list to all those participating in the blog hop today so you won't miss a one. 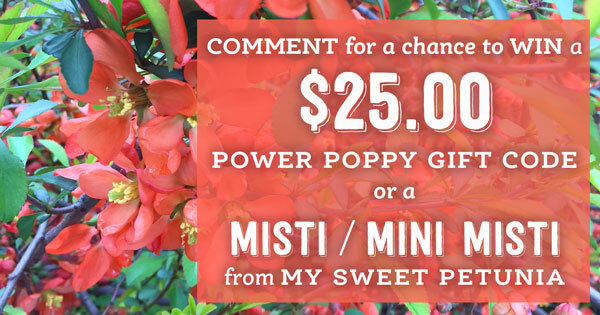 Each one of these gals is super creative and clever, so you'll want to make sure you stop by each of their blogs for some more inspiration and if you leave a comment on each blog, you will be entered to win one of two $25 Power Poppy Gift Code, or a Misti/Mini Misti. 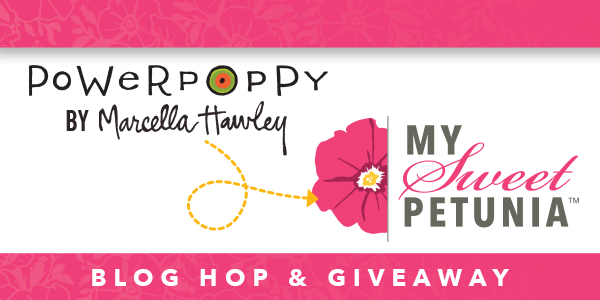 Winners will be announced April 14 on this page of the Sweet Petunia blog for the Misti, and the Power Poppy blog for the gift code. How cool is that!?!? !